Explanation: Monstrously bright, this fireball meteor lit up the Mojave Desert sky Monday morning, part of this year's impressive Geminid meteor shower. 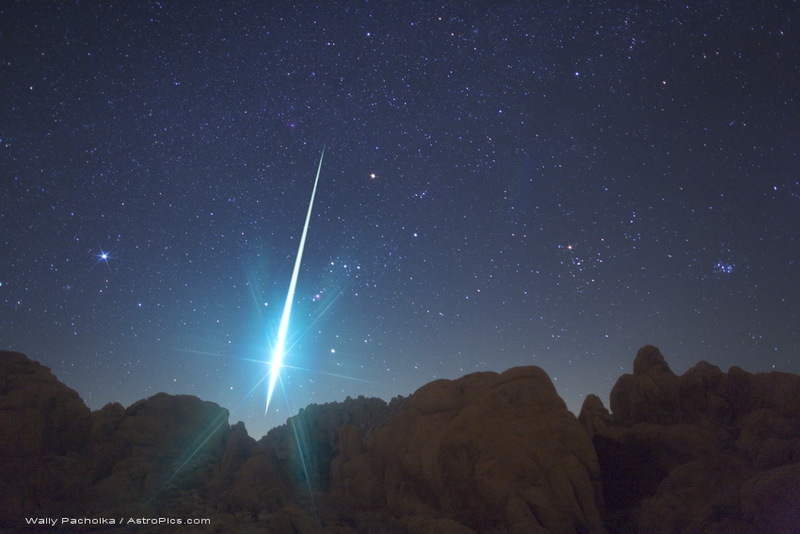 Seen toward the southwest over rock formations near Victorville, California, a more familiar celestial background was momentarily washed out by the meteor's flash. The background includes bright star Sirius at the left, and Aldebaran and the Pleaides star cluster at the right side of the image. The meteor itself blazes through the constellation Orion. Its greenish trail begins just left of a yellow-tinted Betelgeuse and points back to the shower's radiant in Gemini, just off the top of the frame. A rewarding catch for photographer Wally Pacholka, the spectacular image is one of over 1500 frames that he reports captured 48, mostly faint, Geminid meteors.